Arenac: "A sandy place for a good footing." That's what Henry Rowe Schoolcraft observed of the area when he named it after the combination of "arena" referring to the sand in the Coliseum in Italy that provided a better footing for gladiators, and "ac" for "place of." Located at the bottom of Saginaw Bay on Lake Huron, this area has long been inhabited. 5000 year old Native American artifacts have been found in the area. The Rifle, Au Gres, and Pine Rivers made for excellent fishing and canoeing routes for both the Ottawa Indians and early settlers to the area including Captain J.P. Phillips and John Lentz, who started a sawmill in 1856. 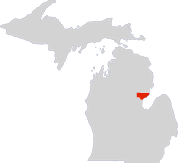 Arenac County organized in 1883 during the lumber boom, keeping to it's name in providing settlers a "good footing" for starting out. Arenac County today remains a popular resort area, with plenty of canoeing, hunting, and fishing. Standish, the county seat, is known as a supply headquarters for those traveling up North. The Rifle, AuGres, and Pine Rivers continue to be favorite canoeing, rafting, and fishing sports providing ample opportunity for Trout, Chinook, Coho, 'Suckers, and Smelt. The miles of Saginaw Bay shoreline Arenac County offer challenging Lake Huron fishing and boating. Camping, swimming, boat launches, marinas and parks are also available throughout Arenac County. Arenac County is an equal opportunity provider. Condado de Arenac es un proveedor de igualdad de oportunidades. Welcome to Arenac County, Michigan. A Great Way of Life. A Great Place to Live. With Business Opportunities Along the North Shore of the Saginaw Bay. Up North, but only 2 hours from Detroit on the the I-75 Corridor and 45 minutes to Saginaw, Bay City, and Midland. Almost 50 miles of Lake Huron Shoreline and Over 150 Miles of Rivers and Streams to Explore and Enjoy. Marinas and Boat Launches for Boating and Fishing on the Saginaw Bay. Canoeing, Kayaking, Camping and Fishing on the Rifle River, Augres River and Pine River. 28,000 Acres of Recreational Lands and Forests For Camping, Hiking, Skiing, Trail Riding, Snowmobiling, Hunting and Fishing. The Financial Summary contents are intended as a means to provide transparency and accountability to the citizens of Arenac County regarding the municipal budget and finances. Within this site, you will find summarized and detailed information for multiple years including both tabular and graphical representations of the data. The County is not necessarily watching the camera monitors at all times...there is not to be an expectation of protection, just because the video surveillance equipment is installed in the buildings. Nov. 29 - Thanksgiving Fri.